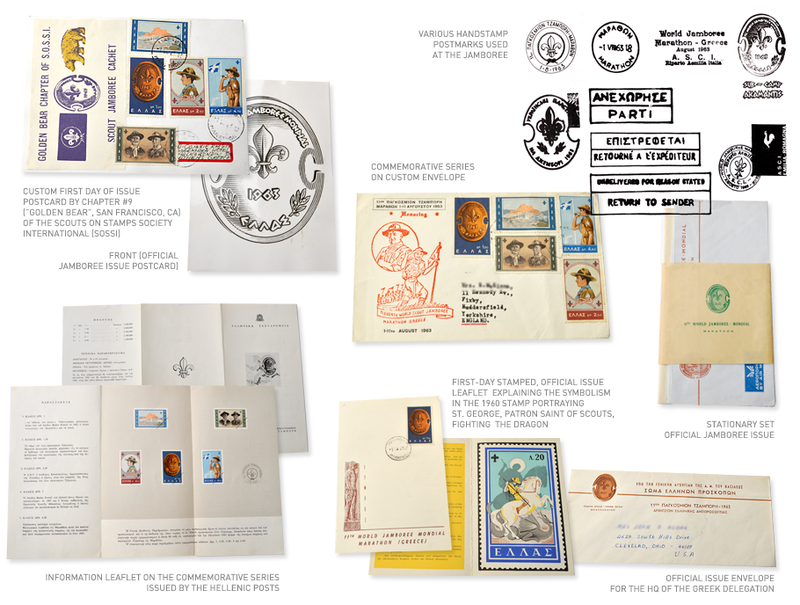 To commemorate the realization of the 11th World Jamboree in Greece, the Hellenic Post issued a special series of 5 stamps which circulated on August 1st, 1963, on the day the Jamboree officially opened. “Athens at dawn”. A water-colour painted by Lord Baden-Powell of Gilwell in 1872, depicting the Acropolis and surrounding area. 2.5 million stamps of this denomination were circulated. The badge of the 11th World Jamboree. It illustrates a Boeotian shield with the badge of World Scouting in the centre. It symbolizes the protection of youth from the powers of evil. 3 million stamps of this denomination were circulated. Η.R.H. the Crown Prince Constantine, Chief Scout of Greece, heading the organisation of the 11th Jamboree. 2.5 million stamps of this denomination were circulated. Lord Baden-Powell of Gilwell, who founded Scouting in 1907, and Athanassios Lefkaditis, Greek professor of gymnastics, who introduced Scouting in Greece in 1910. 2.5 million stamps of this denomination were circulated. A Scout bugling with a conch-shell. A photograph taken at Marathon on the first hoisting of the Scout flag during the setting up of trial Camp in 1962. 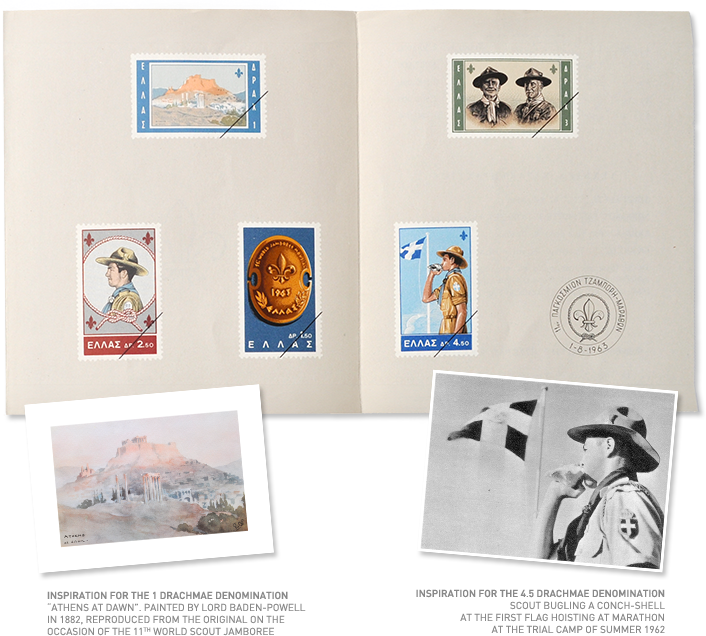 1.5 million stamps of this denomination were circulated.